JYJ just wrapped up their first foray into the “real variety” genre with their series Harvest Trip featuring all three members on a pseudo 1-night, 2-day camping trip. The five-episode series was broadcast on NAVER’s tvcast and follows members Jaejoong, Yoochun and Junsu as they travel, cook and play games. Originally filmed for a fan DVD release, the group went on the trip in March, 2015 before members Jaejoong and Yoochun began their army service in March and August, respectively. The vacation was an opportunity for the group to spend time together before Jaejoong’s impending enlistment, and the episodes are full of the funny, cute moments we’ve come to expect from idol variety shows. The group decided to share highlights from the getaway with fans through the tvcast episodes as a preview for their upcoming DVD. In episode one, we meet the members as they hear about the trip for the first time and joke about what they’d like to do; episode two covers a wood chopping competition to decide who will catch chickens for lunch; episode three is a Jenga challenge over clean-up duties; in episode four the three members sing to impress crew members and avoid sleeping outdoors. Though funny, the first four episodes are somewhat narratively disjointed – jumping from preparing for lunch at the end of episode two to playing games to decide who does the dishes at the beginning of episode three. Luckily, episode five covers moments from the entire trip, helping fill in the story between episodes: showing the members as they comically navigate the Seoul subway, cook lunch with chickens they caught themselves and talk about the hardships they faced over the years. The series was released on the heels of Junsu’s recent issues at the 25th Seoul Music Awards in mid-January. Despite winning the most popular musician award based on fan votes, Junsu was not invited to attend the event which was broadcast on KBS, one of South Korea’s terrestrial networks. While organizers claimed that Junsu was excluded in an attempt to keep down the number of award presentations during the ceremony, the explanation did little to settle the issue. Outrage from fans and voters, who had to pay to participate in the voting, reignited discussion over the JYJ broadcast ban – since JYJ’s separation from their previous label SM Entertainment, the group has been unable to carry out any music or entertainment promotions on the three main South Korean terrestrial networks (MBC, SBS and KBS), due to SM’s influence. Even after the lawsuits between the group and the label were settled in 2012, JYJ continued to be shut out from weekly music shows, variety shows and year-end music festivals. The group’s predicament even prompted the passage of the “JYJ Law” in December, which prohibits broadcast networks from keeping individuals or groups off-air due to external interference. After the latest incident, Seoul Mayor Park Won-soon weighed in, calling the explanation “unconvincing.” He threatened to pull the city’s sponsorship of the awards if the situation were to occur again. Given this history, it’s no wonder that the JYJ members appeared at times awkward and excited at receiving variety idol treatment again during their tvcast series. Several times in the first episode the members mentioned being unfamiliar with making broadcast-caliber reactions and teased each other for overreacting in front of the cameras. In later episodes the members would repeatedly ask for clarifications or look for approval from the filming crew over standard variety show games, and were clearly thrilled at being treated like any other idol. Even when Junsu appeared on public broadcast channel EBS’s Space Sympathy as part of his “Flower” promotions last April, he cried at the opportunity to perform on a music show for the first time in years. What is clear from these incidents and appearances is that there is a great demand for JYJ content – each of the Harvest Trip episodes have more than 100,000 views each on both tvcast and the V-Live app. The group’s management company also releases content through YouTube, but appears to be better leveraging newer platforms such as the V-Live app and tvcast to overcome the broadcast ban. In addition to the Harvest Trip content, C-JeS also recently posted behind the scenes videos from Junsu’s musical Dracula and video of him looking through fan mail. 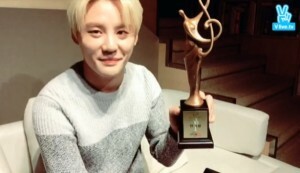 Over on the V app, Junsu hosted a live chat in January to celebrate his Seoul Music Awards win and trophy with his fans, since he was unable to attend the ceremony. With likely more such platforms for idol-related content on the rise, and a greater diversity of options for JYJ to connect with their fans outside of the broadcast networks, it may be possible that by the time all the members are back from army service in two years (Junsu is the only member currently promoting and he will likely enlist later this year) the lack of broadcast appearances may be a problem of the past. What do you think readers? With the changes in the past year, can JYJ finally make in-roads to promote on broadcast channels? Or will the broadcast ban become obsolete with changing technology?